While much of the country may think we live in a frozen tundra, we Minnesotans know differently. We look forward to our steamy hot summers every year. When we’re not basking in the sun, we absolutely love the feeling of a cold burst of air when taking refuge in our homes. But when your central air conditioner is on the fritz, it’s hard to remember that you’d been wishing for these hot temps all winter long. Welter Heating has been in the heating and cooling business for more than 100 years, and every spring and summer we field calls from stressed out homeowners wondering if they’re in need of air conditioning repair. Below are answers (and repair tips) to some of those most commonly asked questions about air conditioning repair. 1. How can I tell if my air conditioner is broken? If the cool air has stopped flowing, the first thing you should do is check your thermostat. If your thermostat display is blank, change the batteries. If the display is still blank, remove the thermostat from the wall and check the wires to make sure it’s getting power. Use a multimeter to check the voltage. If you’re not getting voltage, check your fuse box to see if any fuses have been blown or tripped. If the fuses look good, locate the switch connected to your central A/C and switch it on and off to reset the connection. If it’s getting power, but the screen is still blank, go outside and check the condenser to see if a fuse has been tripped. If your thermostat still isn’t working, it may be time to replace it. Check the warranty to see if it’s expired. Turn on the fan to see if the blower is getting power. Change your air filter if it’s more than one month old. The buildup of dirt and debris could be preventing air flow. If you’re still experiencing problems, call an HVAC professional. Replacing your air conditioner is an investment. The age of your air conditioner. The life of an air conditioner is somewhere between 10 and 20 years. So, if your air conditioner is more than 10 years old, it may be time for a replacement. Rising energy bills. As air conditioners get older, they become less energy efficient. To see if your air conditioner is losing efficiency, compare your utility bills over the past few summers. If your costs are rising, it could be a sign that your air conditioner is wearing out. Leaking refrigerant. Not only is refrigerant expensive, but refrigerant leaks will cause the compressor to eventually go out. The type of refrigerant that your air conditioner needs may also cause you problems down the road. The cost of repair. Call your local HVAC company to get a free quote on repair costs. If it’s more than $3,000, it is probably cheaper to buy a new unit. 3. Why is my air conditioner freezing up? Nearly all air conditioner freeze ups are caused by either a lack of refrigerant, or a lack of air flow to the evaporator coils. If your air conditioner is freezing up, the first thing you should do is turn it off. If you continue to run it, the compressor could be damaged. Thermostat temperature setting. If your thermostat is set below 70 degrees it could be causing your air conditioner to freeze up — and it’s actually not cooling your home any faster. Refrigerant level. If your refrigerant level is low, this could signal a larger issue and we’d recommend calling a professional to have a look. Air filter. A clogged, dirty air filter could be causing the issue. As mentioned above, change the filter if it’s been more than a month since the last change. Vents. Make sure all vents are open to ensure air flow to the evaporator coil. Evaporator coils. If the evaporator coils are blocked by dirt and debris, this could be cause of the problem. Fan. Your fan is what blows cool air through the ductwork in your home — and also helps circulate air back to your evaporator coil. Read “Why is My Air Conditioner Freezing Up?” for more details. 4. Why is my air conditioner leaking condensation? Should I be worried? One function of air conditioners is to extract humidity from the air, so a little bit of condensation is natural. However, leaks usually indicate that there’s a problem with the way the condensate is draining. A dirty or frozen evaporator coil. 5. How do I change my air filter? As mentioned above, you should regularly change your air filter to ensure the air conditioner is running efficiently — and not contributing to other maintenance problems. Choose the right size. Remove your old filter and measure it, or read your user’s manual. Choose the type of filter. You can choose from fiberglass, washable, pleaded or electronic. Install it. Most air filters are extremely easy to install. Follow the manufacturer’s instructions. 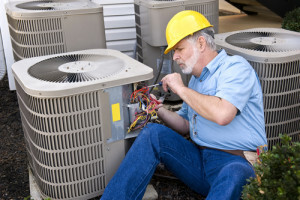 If you have another question about air conditioning repair, contact us today. We’re ready and willing to help. You mentioned that if my unit is older than a decade I should probably consider a replacement. I’m thinking of getting it checked out, some maintenance and see what its life expectancy is. I’m also curious to know the difference in the efficiency between my old one and the newer models. I appreciate your tips that you’ve shared, Rick, in how to identify the symptoms of a broken air condition. I think it’s important that we can understand these symptoms and get the right air conditioning service to fix the problem before it spreads and gets worse. Regular maintenance tends to prevent damages from occurring over time and keep your unit running effectively so it doesn’t wear itself out. When the account runs for several hrs. On very hot days it freezes up. Not all the time but I turn it off for a couple hrs. AC will not turn off blowing cold air. Hi. My brother is building his house soon. He has a split system about 5 years old. He disassemble the unit and ask if I want to install it in my house, as I don’t have an air cond. is it worth it to take his unit and have a specialist installing it, or just goes out and buy a new one. Thank you for your comment. If your brother properly covered the ends of the refrigerant lines so no water got in, I think it’s worth a shot! It might be hard to find someone willing to install it, and there would be no warranty from them, but still — 5 years is just too young to not try it out. Thanks for sharing most important questions about air conditioning repair. Hi Izak, Someone will be reaching out soon! I like your idea to check the air filter to see it it’s clogged and is effecting the air conditioning. My parents have been having problems with their air conditioner. It would be a great idea for them to call a professional to come and fix it so that they don’t have these problems anymore.